Plans Include: Four elevations, floor plans, and foundation plan in 1/4" scale. Electrical plan included, plus cross-sections and standard construction detail. Designed to meet or exceed the standard US and Canadian building codes. Eight (8) copy sets of plans will be shipped to you via UPS/FedEx. Use plans to obtain financing, or to obtain contractor's bids. Prices effective January 1, 2019. 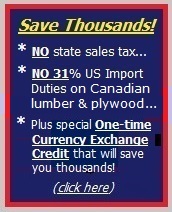 Note: Please call us for Canadian plan prices. Elevations, floor plans and foundation plan in 1/4" scale, plus cross-sections and standard construction detail. Designed to meet or exceed the standard US and Canadian building code requirements. Please call us for information about structural engineering, updated codes and obtaining local permits for building on your property. Toll free: 1-888-358-1113. Plan Sales: We accept VISA, DISCOVER and MASTERCARD.